Bus Cook let it ring twice and hung up before I had a chance to answer. I called him right back. "It was an accident," he said. "I didn't mean to call you." Not a big deal, I thought. What about the Chiefs? I asked. 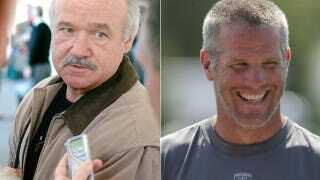 Would Favre be willing to talk to the Chiefs? I think he thought I meant to ask if Favre and the Chiefs had already spoken. "No," Cook said. "I haven't talked to anybody." OK, then. We can thus confirm and even expand on ESPN's exclusive report, since it appears that Brett Favre, though his agent, will listen to just about anybody who calls to ask him questions about who Brett Favre might be willing to talk to.